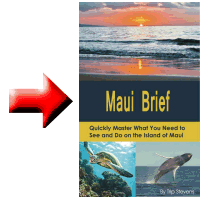 Using the very best websites can significantly speed up your Maui vacation planning process. tripadvisor.com – Because this site is visited by so many people, you can get a wide variety of opinions and reasons that something specific is good or bad. I used to go to expedia.com and travelocity.com for my ratings, but I like TripAdvisor more because it covers places to eat, places to stay, and things to do. Those others cover ratings just for places that will take your money. There are plenty of free places worth visiting that you can read about at tripadvisor.com. They also have a Maui specific forum where you can ask specific questions and get answers from those who travel there often. While tripadvisor can be a great resource, it shouldn’t be your only resource as it suffers from tainted reviews as much as any other internet site. igougo.com – Once at the site, type “Maui” into the search box and hit the magnifying glass. Once you hit the Maui site, you can click on one of the tabs: Overview, Flights, Hotels, Things to Do, Restaurants, and Stories and Tips. There are plenty of reviews here to study. Although TripAdvisor is my first stop and my number one place to poke around, sometimes I read conflicting reviews or see questionable ratings and need a second opinion. This is where IgoUgo comes in. While there, make sure and spend some time in the “Stories and Tips” section as you can learn a lot from previous visitors to the island. The stories found here are more detailed and elaborate than on other similar travel sites. vrbo.com – The acronym VRBO stands for “Vacation Rentals by Owner.” This is the site to go to if you need to investigate your home or condo rental options. Once at the site, type “Maui condo” or “Maui home” into the search box. At each site, you can check the calendar for availability and prices. There are plenty of pictures and reviews to help you size up each place. MenuSearch.net – This site lists the menus of many of the restaurants on Maui. No longer will you need to drive from one place to another (or even Internet surf all the different restaurant sites) to find the one place the whole family will enjoy. Just drop in on this one website and peruse your options. yelp.com – Once you have decided at which restaurant you wish to dine, you can pop over to Yelp and read some of the reviews from past patrons. The good thing about this site is that the food reviews tend to be longer and more detailed than just “it’s good.” The bad news is that Yelp has a reputation for drawing in those types that like to vent and may leave overly negative reviews. FlyerTalk.com – This is mainly a website for frequent flyers. Even if that doesn’t interest you, this can be a very valuable site because it holds the collective knowledge of world travelers, and I am constantly surprised at all the nuggets of wisdom I can pick up at that site. If you aren’t interested in collecting or cashing in frequent-flyer miles, go to the site, click on “Forums” and then “Destinations.” From there, scroll down to the “America – USA” section and you should be able to enter the “Hawaii” forum.